Please join me in congratulating Brandon (Ravens) on his AMAZING Pull. 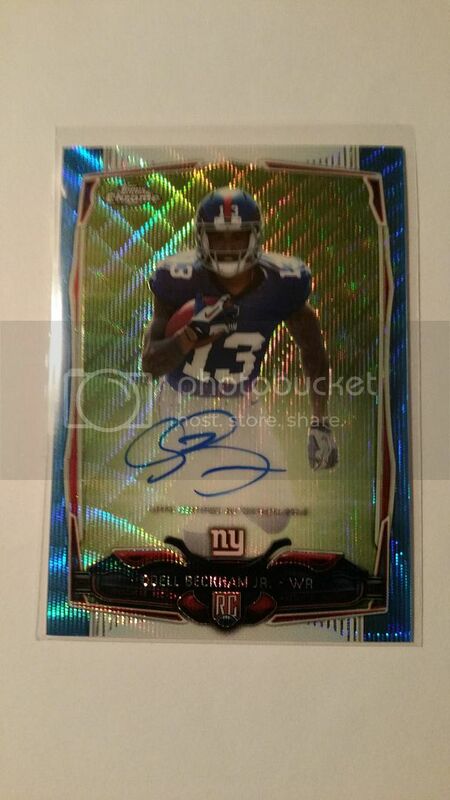 Brandon pulled this 2014 Topps Chrome Blue Wave REF AUTO Odell Beckham Jr /20 from a Wal-Mart Rack Pack!!!!!! His Original Thread can be seen here. After taking a vote, Brandon's pull won by an overwhelming margin! "Baseball players will take anything. If you had a pill that would guarantee a pitcher 20 wins but might take five years off his life, he'd take it" MLB pitcher Jim Bouton about drug use in the Major Leagues... quoted in 1969. If your user name is this color I'm afraid I'll have to pass on any proposed transactions at this time.